Nebraska has been faced with some of the worst flooding in the state’s history this March. From insane amounts of snow, to sudden warm weather and lots of rain, we have been dealing with a lot of water with nowhere to go. Water will always find the path of least resistance, and often times that means coming through cracks in your foundation and leaky window wells straight into your basement. If you find water in your basement, here are some steps you can take to try and mediate damage and fix problem areas. 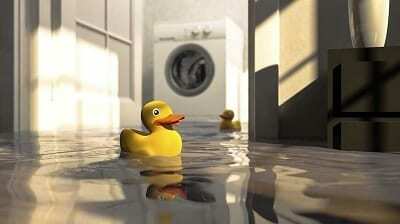 Basement flooding happens. Try and stay calm and be sure to stay safe. Turn off any power to outlets affected by water and don’t handle any type of electrical device in standing water. Be sure to wear rubber boots to stay dry if you need to go down into a flooded basement. If it is safe and you are able, determine where the water is coming from. If water is coming from a burst pipe or water softener, you will need to contact a plumber. If it is coming through a crack in the basement wall, seeping in from the floor, or entering through a leaky window well, you will need to call a professional basement waterproofing company. If you cannot determine the source of the leak, that’s okay. BDB Waterproofing can determine the source of the leak and prepare a proposal for repair. Standing water in your basement can create a lot of problems, including mold and structural damage. You need to remove the water to be able to assess the damage. Try mopping up any water and only use a vacuum if you have access to a dry outlet. If you don’t have a sump pump, it would be in your best interest to get one installed. Sump pumps are used to send water out and away from a home. They are built in a pit or basin in the basement floor. Water drains into the pit, and once it reaches a certain level, it will be pumped out and away from the home to a safe distance — where it won’t be able to seep back into the soil and into the home again. BDB Waterproofing offers sump pump installation in Omaha if you need one installed. Using fans, dehumidifiers, and opening windows can help you get the space dry after removing water. This will help minimize the choice of mold growing. You will also need to address which items in your basement can be kept and which are best discarded. Paper, fabric, wood and leather all attract mold if they remain wet for more than a day or two. Dry out and save what you can, and throw out the rest. You may also have to replace any carpet that got wet during the flooding. A local carpet cleaning company can help determine if it is salvageable or will need replaced. If the water in your basement is from foundation or structural issues, BDB Waterproofing can create a plan for keeping your basement dry. We offer basement waterproofing, foundation repair, can install or repair egress windows and install sump pumps to prevent a serious basement flood from ever happening again. BDB Waterproofing’s qualified design professionals can inspect your property and give you a proposal for repair. Call us today at 402-779-3165 or send us an email to request a free estimate.